Improving building energy efficiency is widely recognised as one of the best strategies for combating climate change in the UK. Yet, uptake of energy efficiency has been slow due to a number of practical barriers, and few building sectors face higher hurdles to energy efficiency than the private rented sector. This sector offers a flexible form of tenure and contributes to increased labour mobility in major cities across UK. It is also the tenure of choice for low-income families and young people moving into cities. However, private rented properties are often poorly insulated and with ever increasing energy prices, renters are increasingly finding themselves trapped spending a significant share of their income on energy bills, (Citizens Advice 2014). Upgrading a property to an energy efficient level would potentially bring down energy bills. Yet, in many rental arrangements, tenants pay rent to their landlord, but are responsible for paying their own utility bills and there is thus no a priori incentive for the homeowner to bear the upfront costs of energy efficiency measures. This gives rise to the issue of split incentive between homeowners and their tenants, a critical barrier to uptake of energy efficiency in the private rented sector. Furthermore, private rented homes shelter a large number of households in fuel poverty and are often poorly insulated to the point of being a health hazard because the occupants are unable to afford the high energy consumption needed to heat these dwellings to a decent temperature. Better financing of energy retrofits would potentially reduce fuel poverty in the rental market, especially among elderly tenants. A key policy driver to reduce the UK’s greenhouse gas emissions is the Climate Change Act 2008, which legally binds the government to reduce annual greenhouse gas emissions by 80% by 2050 and 34% by 2020, relative to a 1990 baseline. The Green Deal launched in 2012 and the revised Energy Company Obligation (ECO), are expected to be supplemented with new regulations to drive improvements on the scale necessary, by providing a stimulus for investment in energy efficiency improvements. Government has announced changes to the Energy Bill to include a legal minimum energy efficiency standard for homes rented from a landlord from 2018 onwards. From 2018, the rental of the very worst performing properties—those rated F and G—will be banned through a minimum energy efficiency standard. 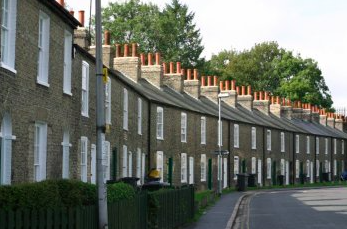 Almost 13% of England and Wales’ 4.2m privately rented homes currently fall below the E rating.This is coupled with the introduction of measures, from 2016, to allow councils and tenants to demand energy efficiency measures from landlords. Particularly, from 2016 onwards, any tenant asking for their landlord’s consent to make reasonable energy efficiency improvements cannot be refused. (Waiting on feedback on typology database provided). According to the 2011 census, 31% of households owned their own home outright, 33% with a mortgage or loan and 1 % under a shared ownership arrangement. The group that rented from a private landlord or letting agency accounted for 15% and 9% of households rented from council or local authority. Energy retrofitting is welcome news for tenants, especially low-income, fuel poor and vulnerable households, many of whom are spending a large share of their income to heat their homes. Landlords, on the other hand, investing in their properties will also benefit as they will own more energy efficient properties that would be warmer and more attractive to renters. In addition to tackling the worst performing stock, local authorities are expected to deliver energy improvements to the whole of the housing stock in their area. Nevertheless, rules are intended to ensure EPCs are made available promptly to facilitate their use in tenant and buyer decision making and to reduce asymmetric information in the residential real estate market. 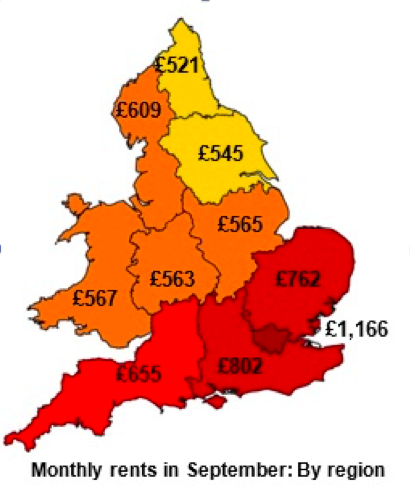 The average residential rent is estimated to be £768 per month in England and Wales with significant regional variations. In terms of the socio-economic groups living in private rented housing, young people account for the majority, with those under 35 representing over 50% of private tenants. Yet, despite the predominance of younger households, the private rented sector caters for households across the age range. The incomes of private tenants reflect in part the age profile of the sector, with both younger and retired households more likely to be on lower incomes. In terms of sub-sectors of the private rented sector, about 46% of households are higher income families, 25% are active or inactive households claiming state housing benefits, 10 % are students and 10 % are retired households. Figure 2 shows that nearly 40% of private renters are spending more than 30% of their income on housing. While more than 15% of private renters are spending over half of their income on paying their rent. 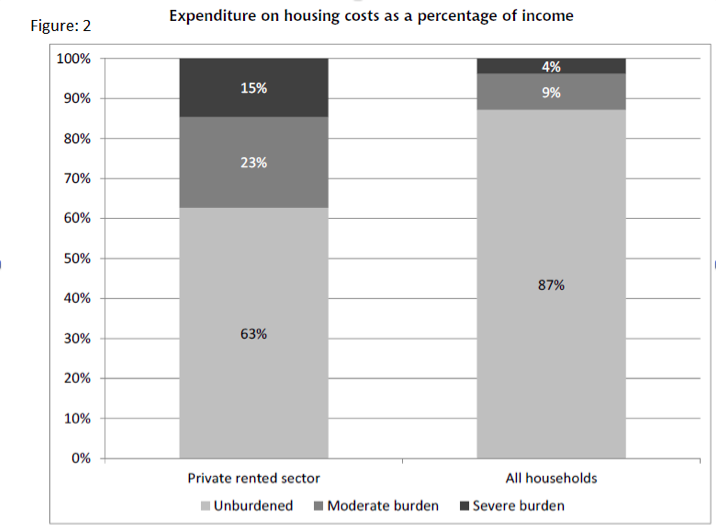 This indicates that affordability and housing cost burden are likely to be an increasing problem for private tenants. The improvements required are not expected to entail upfront costs to the landlord and would be expected to be funded through the Green Deal and any available funding though ECO or related funding schemes. The Green Deal is a government backed initiative aiming to give cashback if tenants install certain eligible insulation and heating improvements such as wall insulation and replacement gas boilers. The Green Deal Provider also provides a loan to cover some or all of the costs of installing energy improvements in homes. Tenants then repay the loan, which will include interest, through a charge added to their energy bill. The amount tenants are expected to borrow is limited by what a typical energy user might save on their energy bills from installing the improvements. Under the Energy company obligation (ECO), the big six energy suppliers in the UK are required to help householders save on their energy bills by installing energy efficiency measures in their homes. Several other schemes exist in helping to deliver energy efficiency measures; Affordable Warmth Obligation is a mean-tested scheme providing heating and insulation improvements for low-income and vulnerable households, Carbon saving Obligation provides funding to insulate solid-walled properties and those with ‘hard-to-treat’ cavity walls. Lastly, Carbon Saving Communities Obligation provides insulation measures to people living in the bottom 15 per cent of the UK's most deprived areas. Source: (Energy saving Trust). A further important policy feature of the private rented market is the fact that landlords can reduce their tax bill by up to £1,500 a year with the Landlord’s Energy Saving Allowance for the costs of buying and installing energy-saving products for properties they rent out.